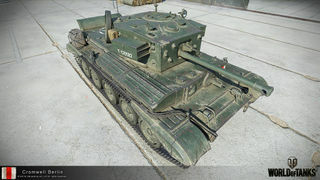 The Cromwell B is a British tier 6 premium medium tank. The vehicle made famous by the British 7th Armoured Division, who had been dubbed the Desert Rats for their exploits in North Africa. However, the 7th Armoured were not issued with Cromwells until 1944, when they returned to the U.K. to prepare for D-Day. In their Cromwells they fought across France and into Germany, and eventually took part in the Victory Parade on September 7, 1945, in Berlin. 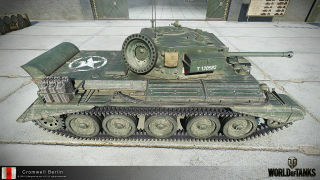 The Cromwell B plays nearly identically to the standard Cromwell, being able to be used as either an aggressive flanker or a mid-range support medium. Generally, both styles are used in a single battle, starting as a support vehicle and switching to as aggressive flanker as opportunities present themselves for the tank to rush in with its amazing speed to chew enemies apart with its quick firing gun. However, it is a delicate tank and care must be taken to not take hits in the early stages of the game, as it will lower your ability to engage harder targets later on. The following are consensus errors or inconsistencies which have been identified with the configuration of the vehicle in question and conflict with information available on the public record. The causes for these divergences in the game are normally not disclosed and may be rooted in game balance. The Royal Armoured Corps recognition mark (or flash) was only used until mid-1942; the Cromwell entered service in 1944. Cromwell B uses the gun performance of the 75 mm HV gun. The in-game model, however, depicts the OQF 75 mm gun. This page was last modified on 18 April 2019, at 06:30. This page has been accessed 86,239 times.